I travelled to Wiesbaden, a small town in Frankfurt, Germany on Tuesday 19 January 2009 with 3 friends. Winter has set in and it is very very cold, especially when one travelled from a very hot country ie Dubai to freezing Germany. 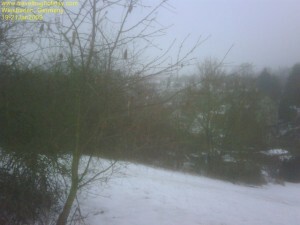 It suddenly dorn on me that it is winter when I had to change from my summer to winter gear as I touched down at Frankfurt airport. I arrived at Frankfurt airport at 6.30pm. I felt very tired and a bit jetlag. Based on my research prior to arriving in Frankfurt, the airport is approximately 28km from the city and I had looked forward to travelling in their famous autobans, the German high speed trains, call ICE (intercity Express). This is a rail system of high-speed trains predominantly running in Germany and her neighboring countries. These trains also cater for the domestic market. Well, I cannot see much of the autoban as the roads were all lined with huge snow piles at both side of the autoban. I was lucky enough to be met by a very good friend, who I first met whilst traveling in Asia. 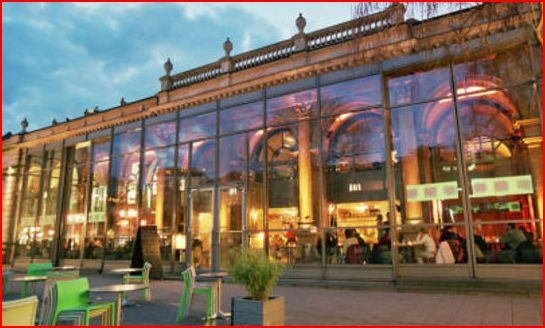 This wonderful friend happen to own a very beautiful restaurant and a landmark in Wiesbaden itself, “The Spital” Restaurant. If it wasn’t for him, I cannot see myself driving a rented car and maneuver over this very icy road. 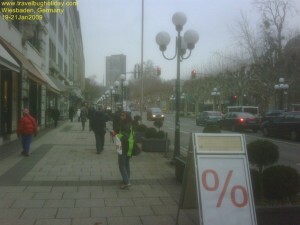 If I had to take a taxi, from Frankfurt Airport (FRA) to Wiesbaden it would costs around €60. Unless it’s the middle of the night and you’ve missed the last train public transport (S-Bahn or Deutsche Bahn) is a much better deal at €3.80 one-way. Temperature can go as low as zero degrees centigrade in December/January and as high as thirty degree centigrade in July/August. The year I went, as per news report, was the coldest year in European history for a long time. 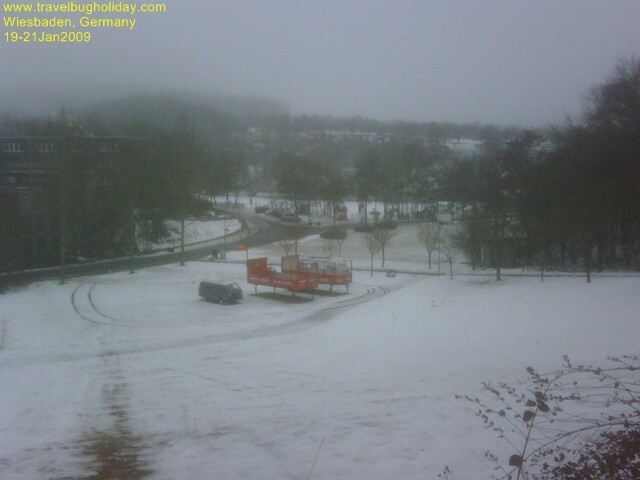 That was the year when they ran out of salt to use to melt the ice on the road! Wow, fancy that…. I was in Wiesbaden for 3 days only and stayed at a bed and breakfast place. Price is very reasonable indeed. I had a lovely bed with my own doona (2 single doonas) in a queen size bed with ensuite and even a kitchen. Every morning all 4 of us were chauffeure d to the Spital for breakfast. I should not say breakfast, but a break “feast” as it most certainly was. 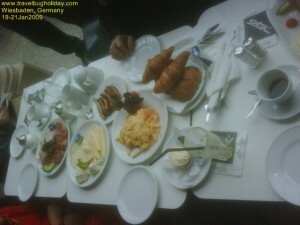 That was the best breakfast ever I had in my whole life. We started off with muesli and yoghurt done in an eye catching design, followed with big glass of fresh juice, different variety of fresh hot bread and croissants, bacon & eggs and coffee/tea. I am kidding you not. Each morning is a variation of similar size kind of break”feast” W e virtually rolled out of the restaurant every morning. Spital Restaurant is set in a historic building that once was the hospital. Thus the ingenious name given by the current owner/restaurateur. This building is set right in the middle of town facing a huge park. Whilst you have breakfast, you can watch the locals walking their dogs, kids playing and flocks of bird flying above you as you look through a clear glass roof. Around this building, are the shops! You can certainly leave your other half in Spital whist you waltz through the shops. This town is bigger than I expected. I had expected it to have just a few rows of shops. 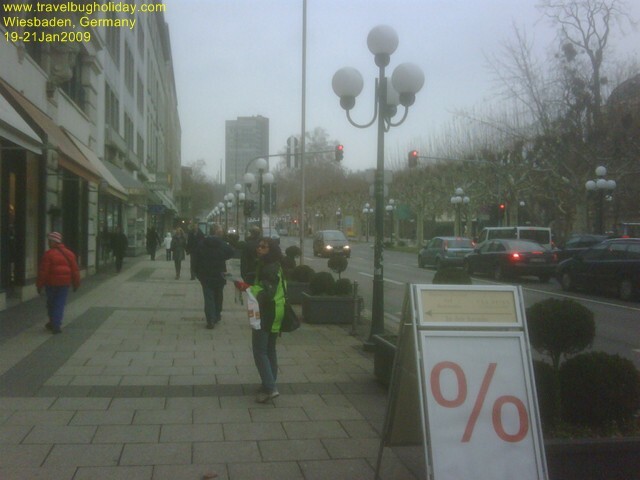 Heck no….It will take you at least 24 hours to go through these shops. 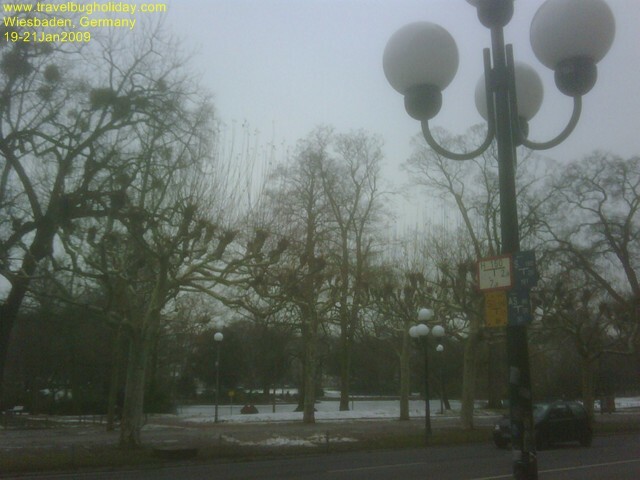 First thing I did on my first morning after breakfast, was to walk to the Tourist Information office, 10 minutes away and armed with a map with a brief description of what sights I can see, all within walking distance from the Wiesbaden Tourist Information office. I had no problem communicating with the local, as they speak enough English to get by. 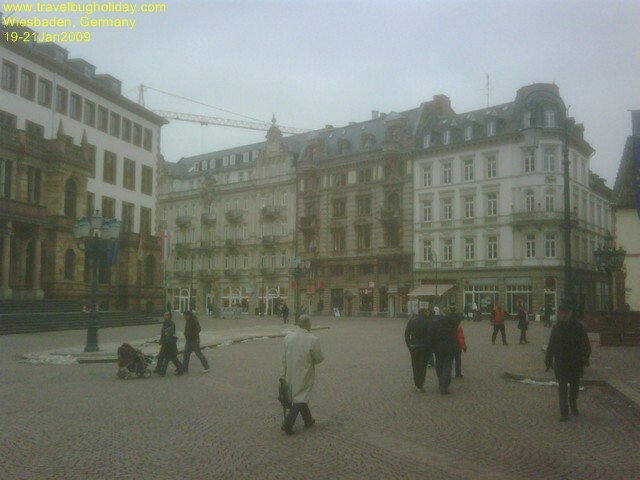 I had a great time exploring this beautiful town with hilly pedestrian streets, squares and boulevards. Once you are in the city centre it’s pretty comfortable to just walk around. 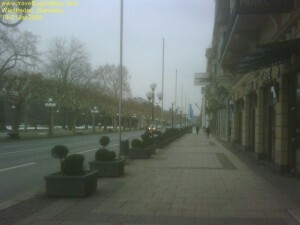 There’s a main pedestrian area (Fußgängerzone) which is similar to an open-air mall, but more relaxed. Shops line the street and alleys, and it’s mostly closed off to cars. 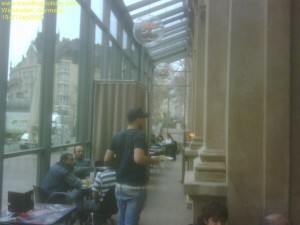 Many shops, cafes and restaurants can be found in this area. Be sure to walk around the “Old City” (Altstadt) as well. If you want to go further out of the city centre, you can use the developed bus system. Buses travel frequently, and on time! It is possible to buy tickets on the bus, just ask the driver (because of possible language-barrier issues, just say the name of the street you want to go to). Your trip will cost you a minimum of €1.40 (adult), but probably no more than €2.20 (one way). There’s also a one day ticket, with which you can go wherever you want, available at the ticket machines for €5.50 and €3.25 for adults and children, respectively. Weekly tickets are available for €19, and have the added bonus of one other adult and all of your own children (up to 14 years old) travelling for free from 7PM weeknights, and all day Saturday and Sunday (and public holidays. 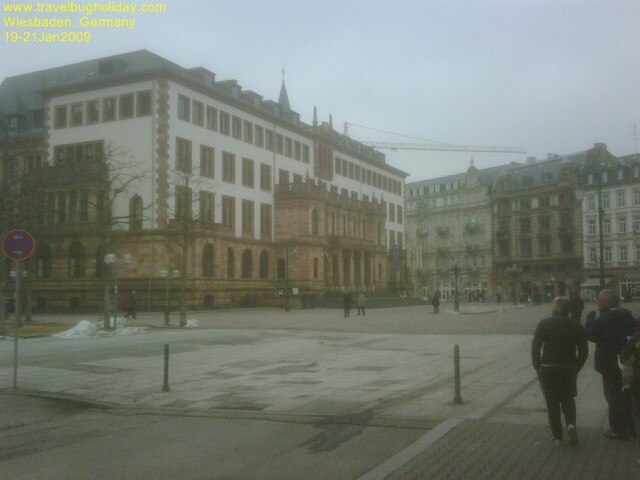 Apparently there is a Wiesbaden Tourist Card (WTC). Single is €11.90 (adult), a group card for up to 5 people €22.50. By showing the WTC, you can benefit from many reductions at numerous tourist attractions and free use of the Re in-Main-Verkehrsverbund public transportation system on two consecutive days. 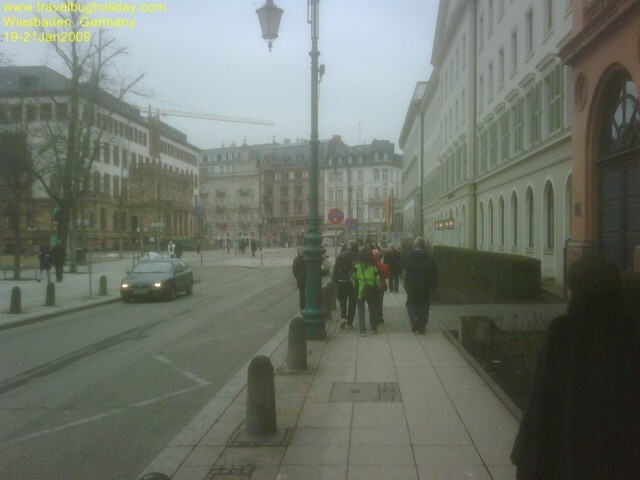 During the 3 days I was in Wiesbaden, I walked most of the time, aside from being chauffeured by my gracious host. I had a chance to walk around the local area where I stayed at as well. Being in a new town, I always like to know about the history of that town. This is what I found out. In the year 40AD, the Romans erected a border fort as a military stronghold. Its central position and the beneficial, curative powers of the 26 hot springs promoted the rapid growth of the civilian settlements. A spa culture developed, giving the Romans fortification its name. “Aquae Mattiacorum” – the springs of the Mattiaci. This latter name denoting the ancient Germanic tribe. The first mention of “Wisbada” can be found in records from the year 829 AD. By the 13th century, the city had advanced to become a royal court and imperial city. In the 18th century, the city economy and culture thrived under the aegis of the Dukes of Nassau. A further step forward was taken in 1806 when Wiesbaden became the capital of the principality of Nassau-Usingen and experienced its initial heyday as a spa. 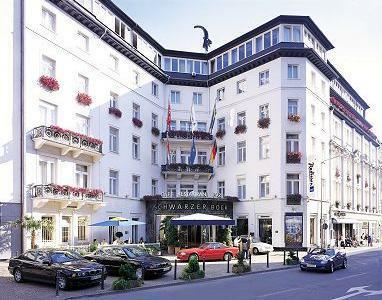 European nobility and famed personality all spent their time there. At the end of the Nassau era in 1866 and during the Prussion occupation, Emperor William II and Carl von Ibell, the Lord Mayor, laid the foundations for a larger city. Population doubled between 1880 and 1905. Aft er 1945, the former world spa transformed itself into a very modern capital – but its particular character has retained until now. That’s the end of your history lesson ! Opposite Spitel is the Grand Hotel. 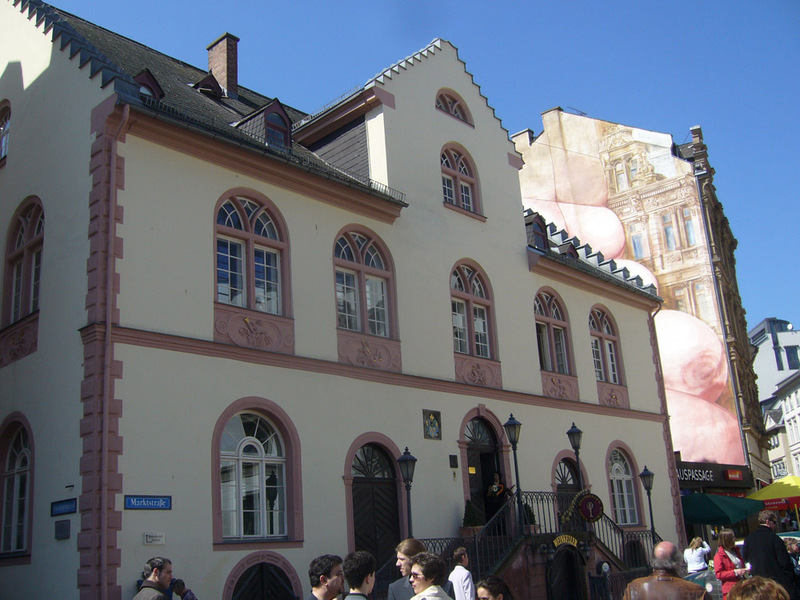 I understood from the locals that this is the oldest hotel in the Germany as most of the historical buildings were destroyed in the war. 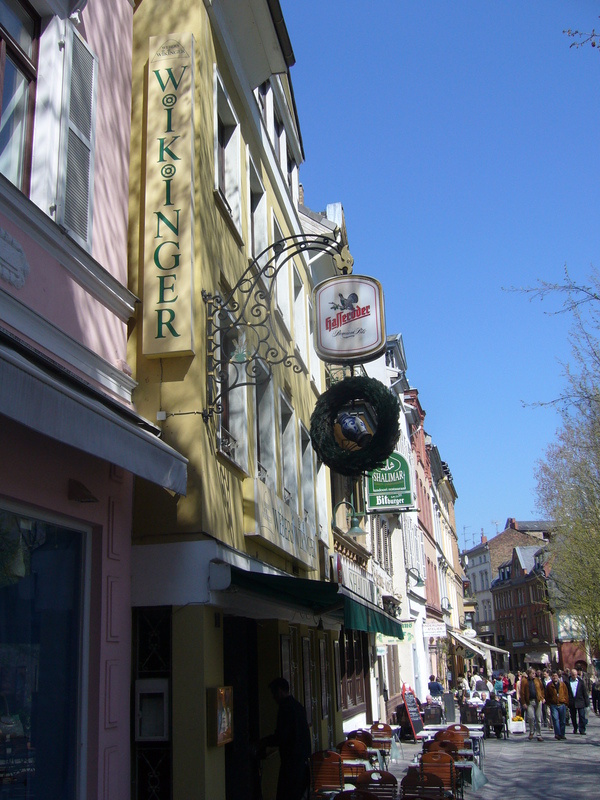 The reason for tbeing the oldest hotel in Germany( I was told) is that this town was occupied by the Americans and allies as their European headquarters during the World War II and thus this German town was never bombed by the Americans and their allies. However the oldest building in Wiesbaden is the old town hall built in 1610. 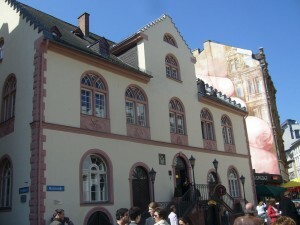 Today, it serves as the Registry Office for births, deaths and marriages. This city hall was built betwen 1884 and 1887 ( not so new !) 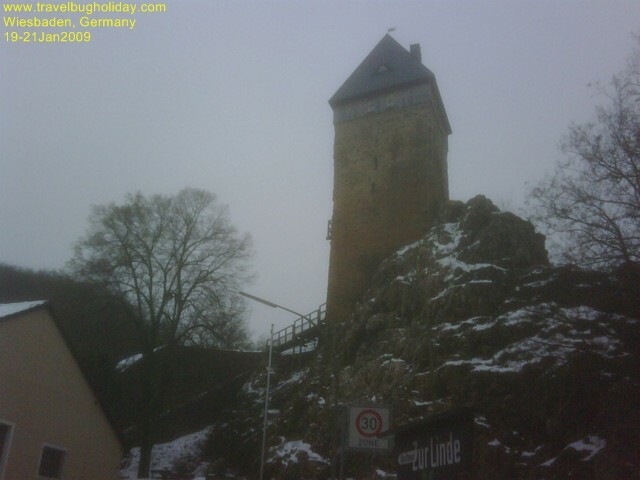 according to the plans of Georg von Hauberrisser. 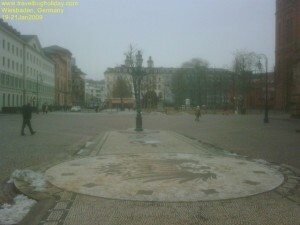 The imperial eagle, flanked by the lions of Nassau abd the lillies of Wiesbaden, can be seen on the paving in front of the city hall. With the night lights on, it is a beautiful photo opportunity. 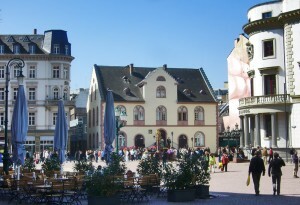 Across the New City Hall is the Palace Square ( Schlossplatz) and Market Fountain, right in the heart of the old city centre. 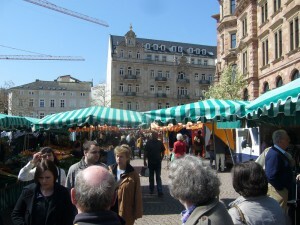 The market fountain stand between the city hall and the city palace. T he fountain was design by J. Barger in 1753 and moved to its prsent location in 1767. I always believ in visiting the local farmers market whenever I am in a new town. 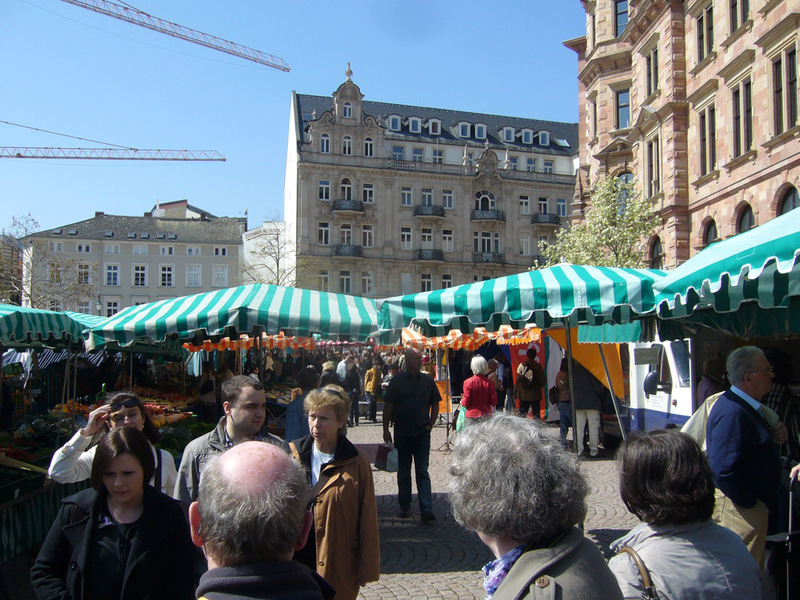 The market is open every Wednesday and Saturday. I enjoyed the noise and local culture displayed in its original form. 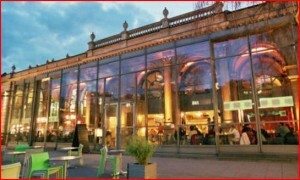 This generous plaza which has underground parking garage is also a revived historic underground market hall. 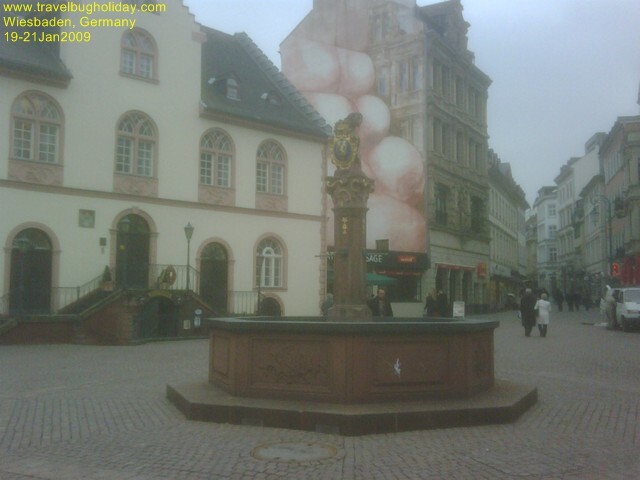 The ornamental piller and old market fountain is worth seeing while I was there. Around the corner of the market place is the palace for the heir to the throne. 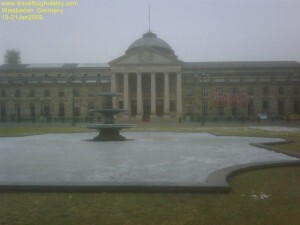 The Palace was built by ChristiannZais in 1820 as the residence of Princ e William of Nassau-Wellburg. Since 1971, the building has housed the Chambers Industry and Commerce. 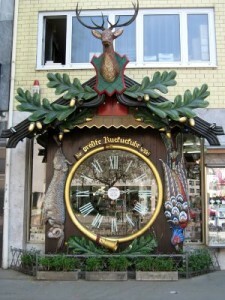 Largest Cuckoo Clock in the World. Don’t foget to check out the largest cuckoo clock in the world. (especially if you have kids). The inside of the shop is a facinating sight as well. The clock was mounted by souvenir slaesman Emil Kronberger in 1946. and was awarded the title in the early 1950’s . It stricks every half hour. 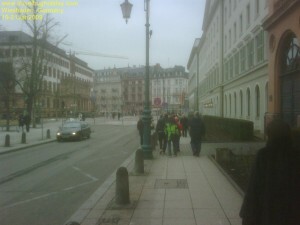 Not far from the Grand Hotel. 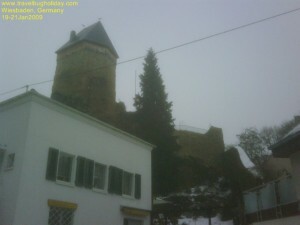 I was most inpressed with their historic old town. This place is a little further away, walking north from the city centre, but worth the visit. 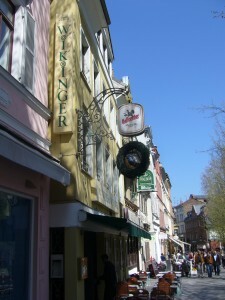 Formally encircled by a city wall (situated between Webergasse, Langgasse and Kirchgasse, Friedrichstrasse and Wilhelmstrasse). Sounds complicated but if you are armed with the map from the tourist information office, it is not difficult to find. Check out the Bakers fountain in Graben-strasse and the oldest still preserved townhouse (1728) which is located at No. 5-7 Wagemannstrausse. 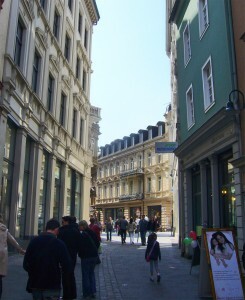 The row of houses between these two streets are the heart of the historic quarters and are known locally as the ”Schiffchen“ (lttle ship). The oldest structure in Wiesbaden is the Heidensmauer, or Heathens’ Wall from Roman times is located next to the Romertor (Roman gateway) and is suppose to be a part of a Roman stronghold datimg back to 364 -375 AD. The Roman gateway was built in 1902 with a covered wooden bridge. In the Roman open-air museum next to the gateway, there are copies of stone tablets found in Wiesbaden from the Roman era. 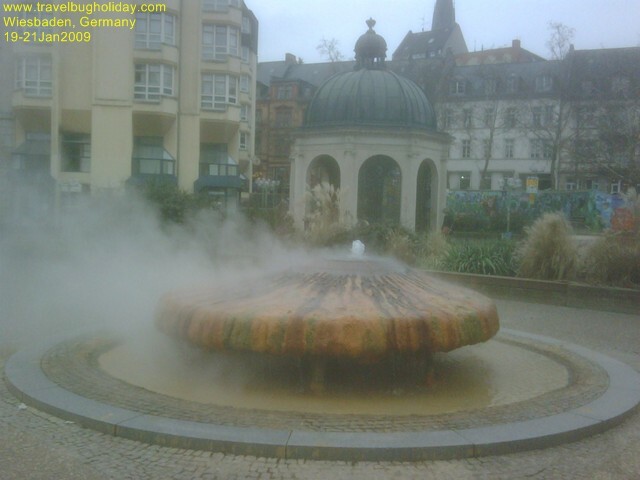 If you still have the time and energy, this historical old quarter , the hot fountain is furthr north again. This area is famous for its hot mineral springs. Narrow winding streets lined with 18th and 19th century buildings run through Wiesbaden’s old quarter. 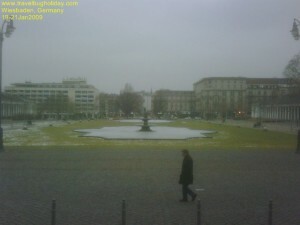 Bäckerbrunnen fountain on Grabenstrasse is now a popular meeting place. 15 different springs flow into the Kochbrunnen drinking fountain and in the 19th century it was the focal point of all those who had come to take the Wiesbaden waters. 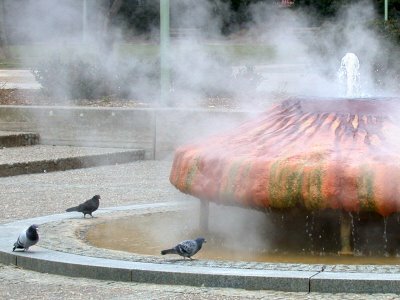 The temperature of the msot famous sodium-chloride thermal spring is 66 degree C and gushed 346 litres of mineral water per minute. Near the new city town hall, is the Protestant Market Church, which was built in 1852-1862 by Karl Boos in the form of a neo-Gothic, triple-naved basilica. The west tower is 92 metres high, making it the highest building in the city. The church was the first all-brick building in the Duchy of Nassau. 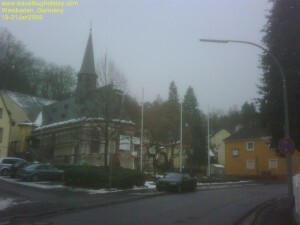 In front of the church, the monument“Der Schweiger“ ( the Silent) stans in front of the church in commemoratin of William 1, Prince of Orange. (1533-1584). 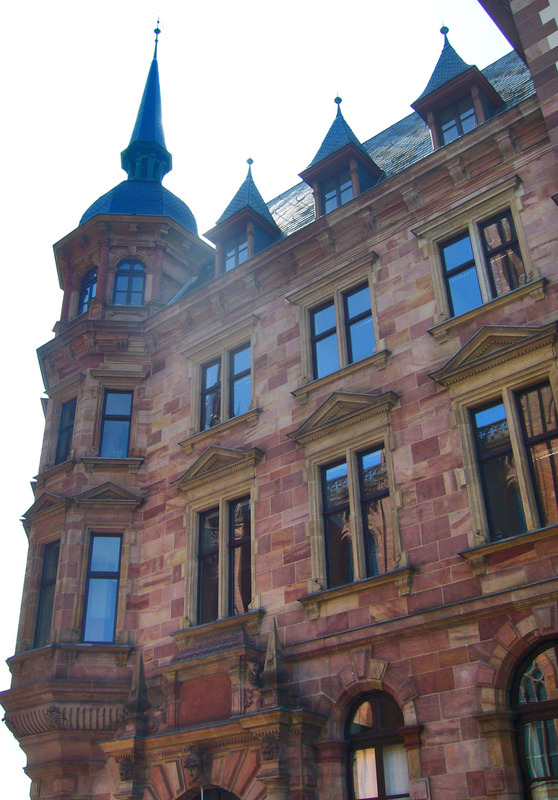 Wiesbaden’s focal point and main landmarks are the spa assembly rooms and elegant casino, built in 1907 under the aegis of Kaiser Wilhelm II. 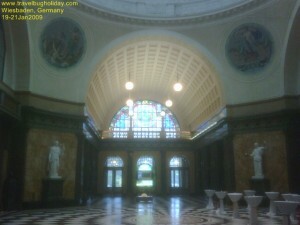 Wiesbaden spa assembly rooms, an imposing building with a massive portico of Ionic columns, is a venue for national and international congresses, conferences, exhibitions and cultural events. The casino is located in the former wine hall with its neo-classical interior. 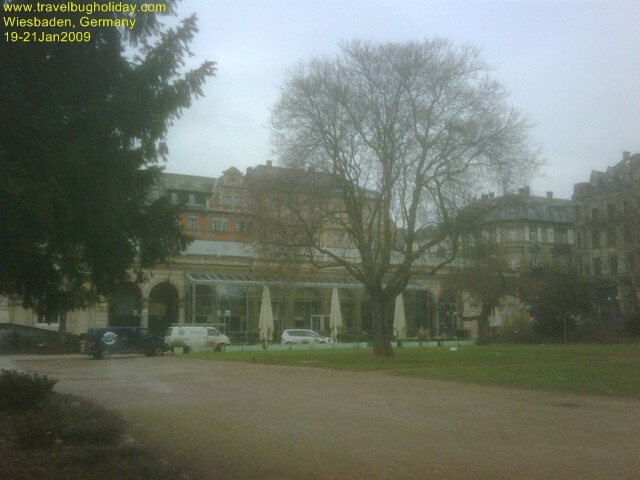 Next to it, the spa colonnade (1827), 130 metres in length, is regarded as the longest columned hall in Europe. The English-style spa gardens extend behind the spa assembly rooms. After 1872, when an imperial las resulted in casinos being closed down, it was not until 1949 that gambelling could resumed, this time in the theatre fower. 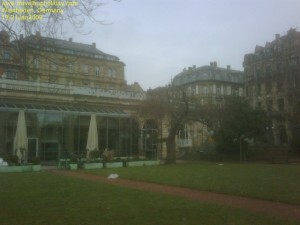 Today the casino is to be found in the formr wine hall of Kurhaus. It is a small casino as compared to Vegas or the Crown casino, in Melbourne Australia.